Jim Watkins and Wade Thompson were flummoxed by Minnesota apples. The longtime friends were set on starting Minneapolis’ first cidery, using locally grown varieties like Honeycrisp and SweeTango, both developed at the University of Minnesota. Though crisp and juicy, sweet and tart, these apples were scarcely suited for cider production. The obvious path—simmering hops in cider—was a big fail. “If you boil hops too long into cider, it tastes terrible,” he says. Ingredient sleuthing led the friends to sorghum, which is naturally bitter, sometimes overly so; their first sorghum-fueled cider was too metallic and tannic. It took nearly two years to calibrate the right ratios, leading to 2013’s launch of Sociable Cider Werks, which makes drinks that are equally tasty and tough to classify. Hop-a-Wheelie is heaped with citrusy Cascade and piney Chinook hops (none were boiled), Pinch Flat is fermented with saison yeast, and Spoke Wrench might be the world’s first stout-cider hybrid. “People were like, ‘A stout cider? What is that? It’s not even a thing.’ Yeah, it wasn’t a thing until we started making it,” Watkins says. Before Americans drank beer or rum, early settlers sipped cider. Apple trees thrived in New England’s rocky soil, the fruit easily converted into alcohol—a potable alternative to oft-unhygienic water. Everyone consumed cider, from kids (they sipped featherweight ciderkin) to George Washington. In the mid-19th century, cider slid from ubiquity as temperance fever gripped the country and German immigrants manufactured crisply alluring lagers in America’s ascendant metropolises. (Cider remained an agrarian undertaking.) Post-Prohibition, cider became a synonym for teetotaling juice, and cider turned sticky and sweet. Instead of aligning themselves with wineries, many cideries are cross-pollinating with breweries. Hops and beer yeast are regularly used at Oregon-based Reverend Nat’s and Wandering Aengus, and at Vermont’s Citizen Cider, which packages its ciders in 16-ounce cans (as well as bombers and bottles). That’s also the favored format for Michigan’s Vander Mill and Uncle John’s, while Maryland’s Millstone utilizes swing-top bottles, wild yeast and collaborations with breweries such as Stillwater, Oxbow and Other Half to stand apart. Brewers have also entered the orchard, with cider lines offered by Hopworks, Harpoon, Stevens Point and Boston Beer—its apple division better known as Angry Orchard. In many ways, cider is closer to wine than to beer. Both wine and cider are fermented from crushed fruit, and the government taxes both accordingly. But creativity-wise, cider makers are following craft brewers’ try-anything footsteps, utilizing hops, unlikely yeast strains, bourbon barrels and spices aplenty. Auburn, Washington’s Schilling steeps ciders with chai tea, jalapeños and Ecuadorean cocoa nibs, while Seattle Cider Co. cans a cider infused with grapefruit, orange and lemon peels. Burlington, Vermont’s Citizen Cider uses Belgian beer yeast to make its witbier-inspired Wit’s Up, and Full Nelson is aromatically charged with New Zealand’s gooseberry-scented Nelson Sauvin hops. “IPA drinkers love that profile,” says cofounder Kris Nelson. When Nelson, a former wine salesman, chemist Bryan Holmes and farmer Justin Heilenbach founded Citizen Cider in 2010, they sought to polish and update a dusty sector. “While we were first making cider, we thought, ‘How can we make something that’s consumed at the same frequency as beer?’ ” recalls Nelson. Beyond utilizing familiar ingredients, Citizen Cider paid close attention to packaging. In Vermont, where the Alchemist’s Heady Topper helped legitimize and popularize canned beers, that meant cladding ginger-jolted Dirty Mayor and brisk Unified Press in aluminum. “We want people to drink cider the same way they drink beer,” Nelson says, noting that the taproom—a testing ground for new concepts—regularly attracts beer drinkers. “We get immediate feedback from people who are incredibly fluent in beer language, which is very helpful,” Nelson says. Like many residents of Portland, Oregon, Nat West loved craft beer. With cider, though, he drew a blank. One day, a bit more than a decade ago, West was helping a friend tackle a bountiful apple harvest. They made pies and butter, sauce and dehydrated slices. After the cooking ended, apples still remained. Maybe cider was the move? Though West had never sipped, much less fermented, a cider, he MacGyvered together a press. A single taste of the sweet, tart and rich juice, and West knew he’d found a new main squeeze. Over eight years, West sharpened his cider-making skillset, employing beer-centric techniques heavy on hops, fruit juices and yeasts both wild and domesticated for brewing. “My approach to cider has been about a love of beer,” West says. In 2012, West debuted Reverend Nat’s Hard Cider(he’s an online-ordained minister), bridging beer and cider with revelations such as Hallelujah Hopricot. It’s fermented with saison yeast and spiced with coriander, bitter orange peel and grains of paradise (classically used in witbiers), then blended with apricot juice and finished with Oregon-grown hops. “The Northwest is hops country, but it’s also cider country,” says West, who worked with brewers to perfect his dry-hopping regimen. He’s such an advocate of hop-flavored cider that, in 2014, he launched Portland’s now-annual Hopped Cider Fest; this year’s celebration, which took place in April, featured nearly 50 offerings, including two international entries. Purists might decry gimmickry, but the practice is no parlor trick. “There’s an age-old history of hops in cider,” says West, adding that the use dates from the 1600s. Applying brewing techniques to cider is hardly without hiccups, especially when using beer yeast. Apple juice is filled with fructose, a simple sugar that yeast easily digest. Hooray? Hardly. “Yeast express their unique flavors and aromas when they’re stressed out or working hard, but there’s never a chance for a yeast to work too hard when cruising through apple juice,” West says. To help yeast express desired characteristics, he artificially induces stresses through temperature extremes and nutrient deprivation, a tightrope walk that took years to perfect. For Minnesota’s Sociable Cider Werks, blurring boundaries presented a different problem. When Sociable tried determining its tax status, the company received an unexpected edict: the company was making malt beverages, not cider. “As far as we know, we’re the only cidery in the country that’s licensed as a brewery,” Watkins says. “Being licensed that way allowed us to brew some wacky stuff.” (Sociable also makes beer.) So when Sociable packaged its beer-cider hybrids, known as graffs, a single format made sense: 16-ounce cans. “We want people to think of our cider as a quality craft beer in a can,” Watkins says. A hallmark of modern brewing is collaboration, of multiple brewers joining forces to create a singular product. The process is an exchange of ideas and skills, a way for brewers to rock free from ruts. Increasingly, cideries and breweries are fashioning ferments that blend the best of both beverages. Portland’s Gigantic Brewing recently joined forces with Beau’s All Natural and Cider Riot! to create Snakebite, a bubbly blend of kölsch and cider flavored with black currants. New Belgium, Two Beers and Seattle Cider turned out Graff[T], an India pale lager containing 10 percent unfermented apple juice, while Denver’s Wit’s End made Cibeertron with Belgian yeast and Gala apple cider from Colorado Cider Company. Sherrer has a tabula rasa to etch his vision of modern American cider. That means making funky, smoky and oak-aged cider; sparkling cider aged with local Cascade hops; and a kriek-style creation tarted up with Maryland-grown cherries. The beer influences are subtle yet strong, leading Sherrer to collude with brewers who share his unique mindset. “Unless a brewery has a passion for wild beer and native yeast fermentations, I’m not going to work with that brewery,” he says. As breweries continue to diversify, they’re increasingly starting divisions dedicated to cider. It’s a savvy business move, offering consumers a gluten-free and taste alternative. The undertakings vary in scale. Lexington, Kentucky’s Country Boy uses local apples to make several hard ciders available at its taproom. At the other end of the size spectrum, brewing conglomerates MillerCoors and ABI had splashy national rollouts for, respectively, Smith & Forge and Johnny Appleseed. Somewhere in the middle sits Ciderboys, produced by Wisconsin’s Steven’s Point Brewery, and ciders made by Boston’s Harpoon. Of course, no conversation about breweries and cider is complete without Angry Orchard, Boston Beer’s breakaway success. Since hitting shelves nationwide in 2012, the brand—which includes English-style dry, apple-ginger and hopped variations—has grown to be about 60 percent of the cider market. Piggy-backing on Sam Adams’ deep distribution, Angry Orchard quickly carved out real estate at convenience stores and supermarkets, and on the tap lines at bars. Having conquered that realm, Boston Beer’s next play is to turn a 60-acre apple orchard in New York’s Hudson Valley into its R&D hub. That’s a key takeaway. In America, cider roosts on an exciting, if precarious, perch. Craft brewing provides a template about how you can upend a beverage industry by focusing on flavor and technique, but it’s easy to go overboard. “There’s a line where a cidermaker relies too heavily on other ingredients and it can become gimmicky,” says Ben Sandler, who co-owns New York City’s cider-exclusive Wassail restaurant. And as with beer, cider must overcome hard-wired perceptions. 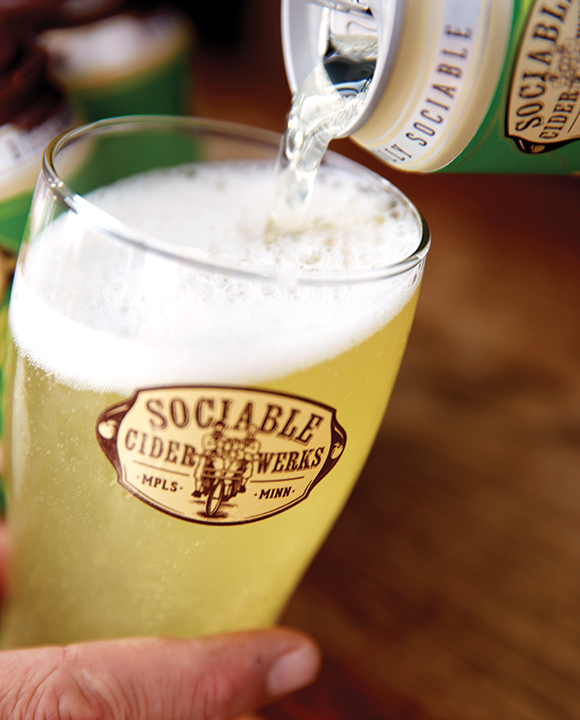 “We struggle with people’s expectations that cider should be very sweet,” says Sociable’s Watkins.